Wildfire survivor Allyson Watson says the new prosthetic helps. A NEW TYPE OF PROSTHETIC IS GIVING PARTIAL FINGER AMPUTEES MORE INDEPENDENCE. — SAN DIEGO (KGTV) - In just 10 minutes, life went from normal to forever changed for Allyson Watson. “The sheriff came to our gate at 8:01 and at 8:11 I was being transported to Palomar Medical Center to be stabilized," she remembers. Watson was trying to escape the 2003 Paradise Fire. “Visually what I remember, it literally looked like everything was on fire, the sky, the ground, everything," said Watson, describing the firestorm. Over 85 percent of Watson's body was burned, all 10 fingers were amputated, and she was left with deep emotional scars. The then 21-year-old had lost her independence, but in the years after worked to get pieces of it back. "I can do everything from type 45 words a minute to clasping a necklace clasp." Over the years she's rejected traditional prosthetics that offer no function. “I remember putting on this glove thing that looked like a hand and I kept looking at it going, is this my life now? Am I going to spend the rest of my life now hiding me, hiding myself?" But then a friend posted a YouTube video on her Facebook page about a functional prosthesis for people with partial amputations. Created by Naked Prosthetics , it moves with a person's hand mimicking a natural finger. “For us, function is about getting somebody back to work, back to life, back to doing what they want to do," said Bob Thompson, CEO of Naked Prosthetics. They created the product to help the vast amounts of construction workers who've lost partial fingers and wanted to get back on the job. Thompson says in the United States alone, tens of thousands of people have lost fingers. “We don’t try to make it look like a finger; we try to make it work like a finger. So function is everything for us. And aesthetics, we want to make it look cool, something somebody is proud to wear," said Thompson. “The first time I saw Naked Prosthetics I was so excited about the fact that this was a functional prosthetic; it would work with me instead of trying to hide me," said Watson. While she's adapted to her amputations, there are still things that are difficult to do, like buttoning a button or tying shoes. Naked Prosthetics is based in Washington but connected Watson with San Diego-based Bionics Orthotics & Prosthetics . Nicole Keller, a certified orthotist and prosthetist, fitted Watson for her custom Naked Prosthetic. The process involved taking a cast impression of her hands. Keller says the device is groundbreaking for people with partial amputations. 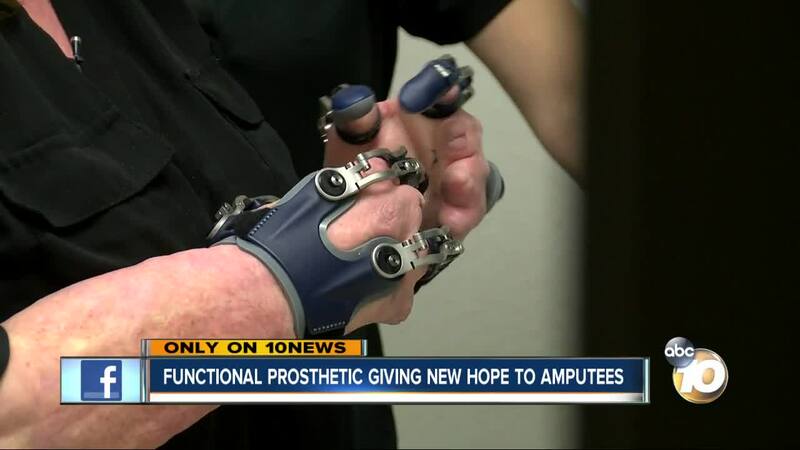 “Your hands are so unique; they’re a unique part of your body that is very fine motor skills, and a lot of prosthetics don’t have that, especially for partial fingers," said Keller. Watson shares her story in hopes to encourage other amputees that a life with more independence is possible.